This week I have been working on recalling my cotton spinning skills. 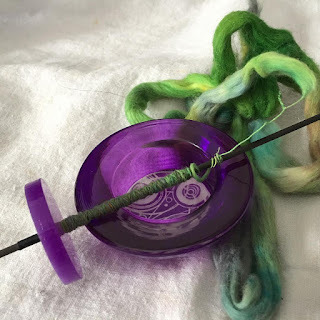 I have a new support spindle and bowl from Hipstrings, which I love! This came with a sample of variegated green Upland cotton. I also have a video purchased from Taproot Video, Joan Ruane's "Cotton Spinning with the Takli." 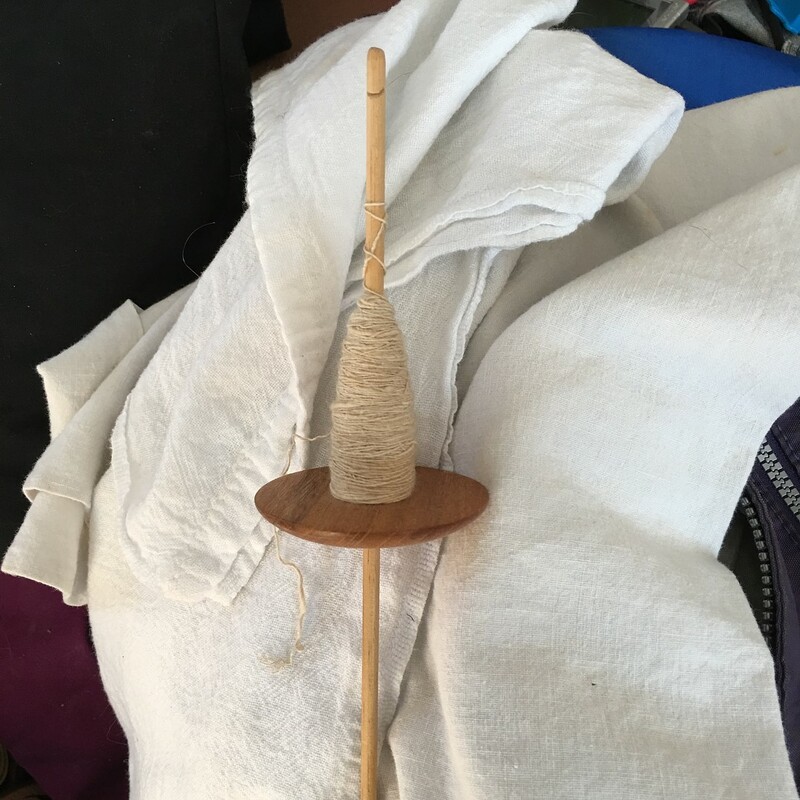 I've been watching that a little bit at a time for the last couple of days, trying to work on cotton spinning skills I know I possessed at one time! 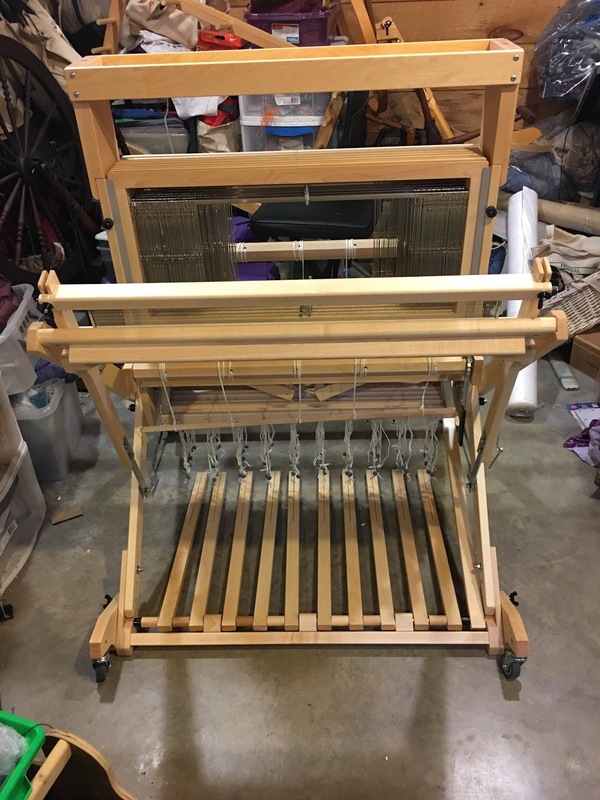 Then I went on the Interweave.com website and purchased the downloadable versions of two more videos - Stephenie Gaustad's "Spinning Cotton", and Norman Kennedy's "Spin Flax and Cotton: Traditional Techniques". Ah, yes, cotton is not the sole focus of this current obsession! I signed up for an all-day workshop on June 30 at Aker Fiber Farm in Enfield, NH on growing, processing, and spinning flax. I was down in the basement this morning looking for a stash of handspinning cotton that I know I have, and came across proof of prior cotton spinning efforts. These were done probably 10 years ago, most likely on a charkha (I do still have a charkha as well). 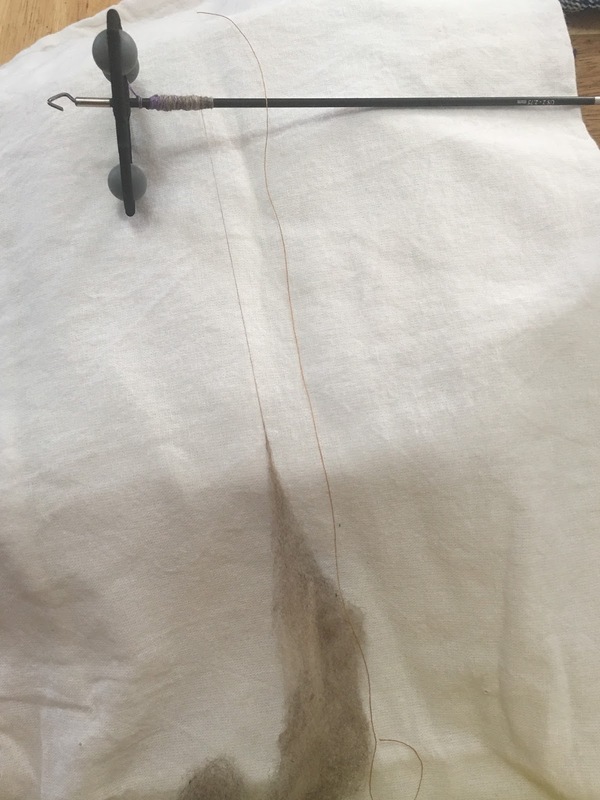 Besides these quills holding handspun cotton, I located two Akha spindles, one with cotton still on it. 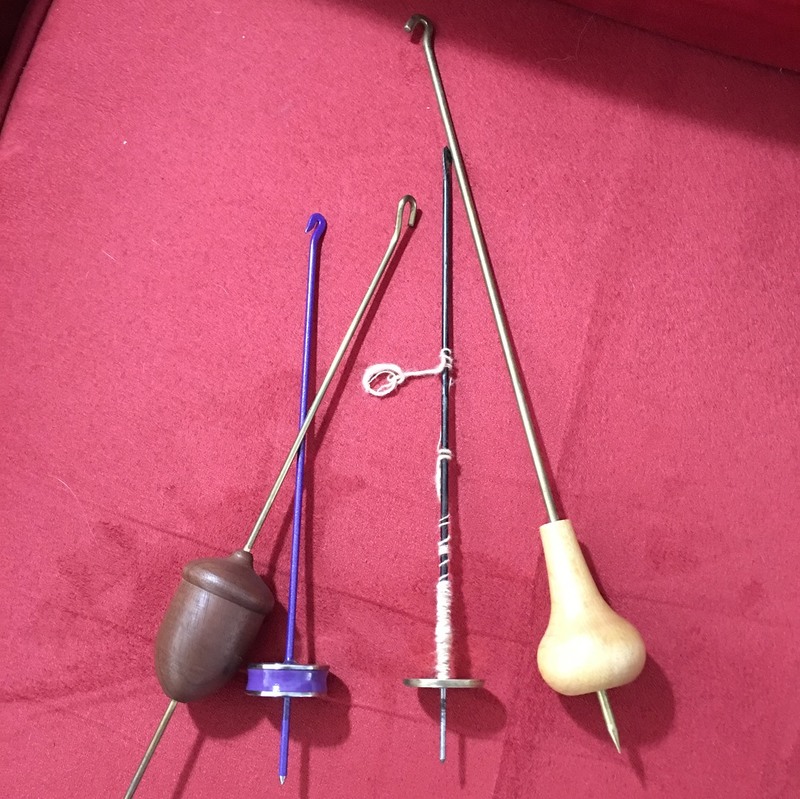 And I managed to round up my Takli spindle collection. I still have a few things to fill in. The purple Takli is from John Galen. He has another spindle or two I'd like to add. 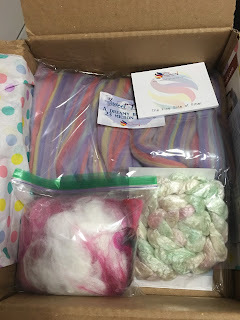 I also plan to order a cotton sampler pack, and I have some cotton handcards on order to learn to make my own punis (cotton rolags, ready for spinning). In the meantime, it is only a few days until I leave for Stitches United, for my band weaving classes with John Mullarkey! So excited! 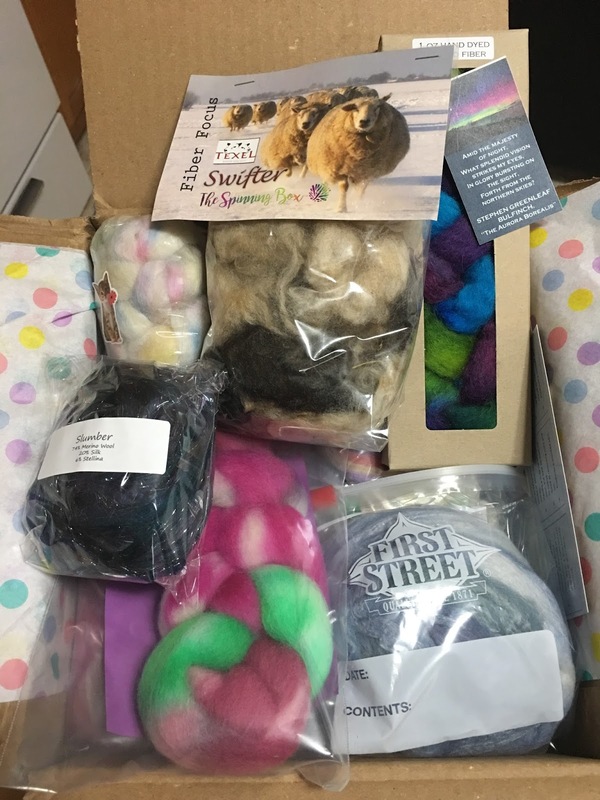 After that, I'll be counting down to NH Sheep and Wool in May! 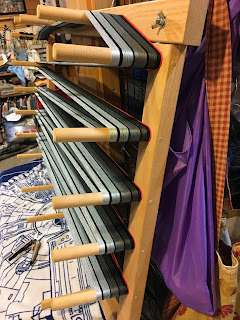 I am also planning at this point to attend the Fiber Revival in Newbury, MA in August, NY Sheep & Wool Festival in October, and the Northeast Handspinners Gathering, in November, in Nashua NH! Joan Ruane is one of the teachers being featured there. Class lists and registration are not available until June 1st, but I'll register as quickly as I can, and hope to get her class. Abby Franquemont, another favorite instructor, is also listed. 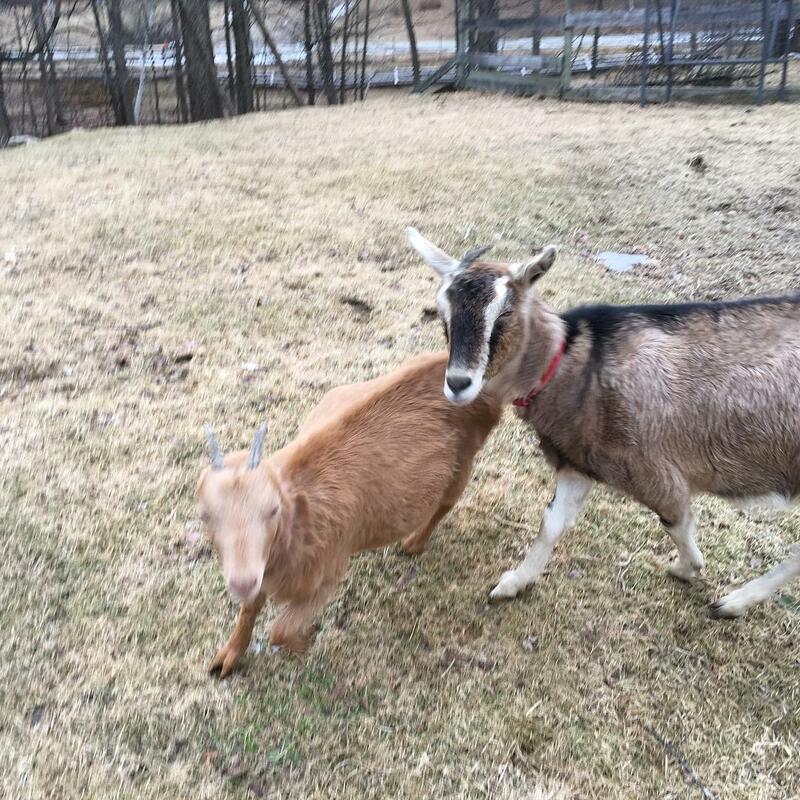 I'm going to take advantage of a bit of flexibility while I'm not milking any goats, as long as hubby continues to be agreeable. Looks like a fun year ahead! Busy around here has recently included 18" of snow, and a 24 hour power outage. 24 hours certainly beats days (and twice in the 24 years I've lived in this house, weeks) without power. 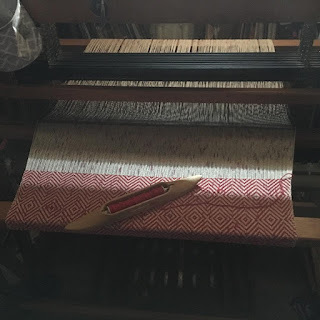 I spent part of that time figuring out how to get some weaving done by the light of the small casement window. The big Macomber is the only one in a room with any outside light, so I worked on the Peaches & Creme baby blanket. This one is the Goose Eye Baby Blanket from the Nov/Dec 2017 issue of Handwoven magazine. I actually managed to get a handle on the pattern repeats by the time I had to stop. 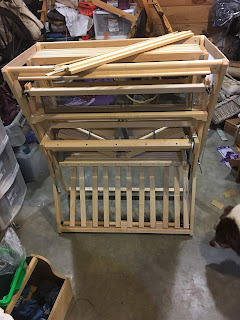 These are my loom dogs! The two Aussies (Penny, red tri full size Aussie, and Jasper, red merle mini Aussie) are the only two dogs that will come downstairs into the basement with me. The two Border collies, River and Remy, refuse to come down. 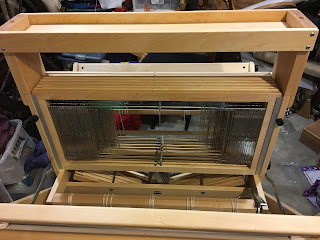 Today, after spending far too much time shoveling yesterday, I managed to make progress on warping the Baby Wolf, and beginning to wind my next warp. 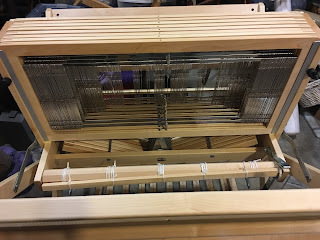 This is the warp on the Baby Wolf. 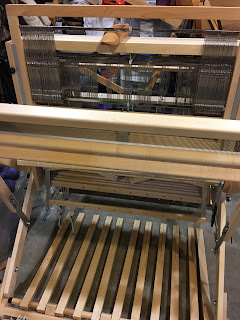 It took me about a week (the warp was already measured, wound, and chained) to get this into the raddle, wound on the back beam, threaded through the heddles, and sleyed in the reed. Today I tied on to the front beam. The yarn is Maurice Brassard 8/2 cotton from Lofty Fiber. 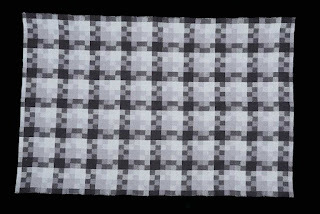 This is the pattern - twill blocks, the Masters Towel pattern from Lunatic Fringe yarns. 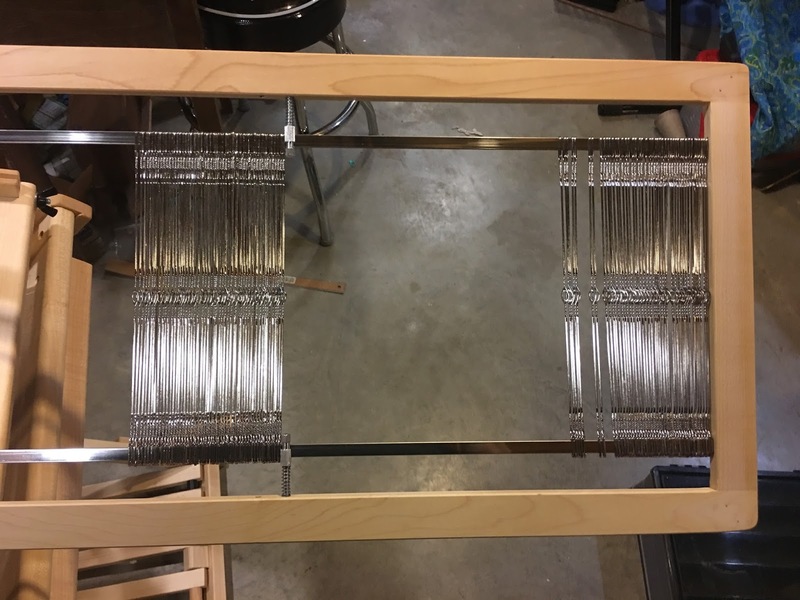 I also started winding the warp for my next project. 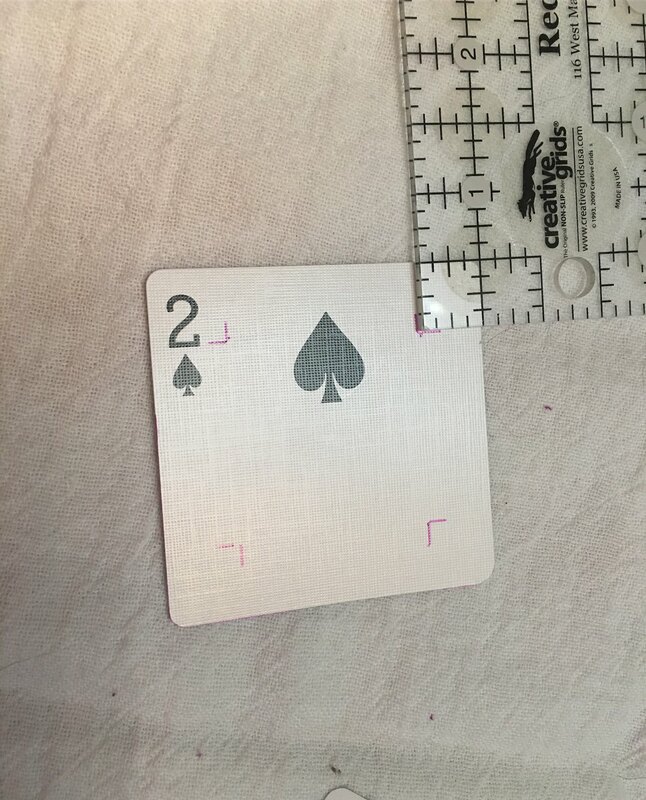 These are shades of gray from the previously-purchased Gray Matter kit from Lunatic Fringe. 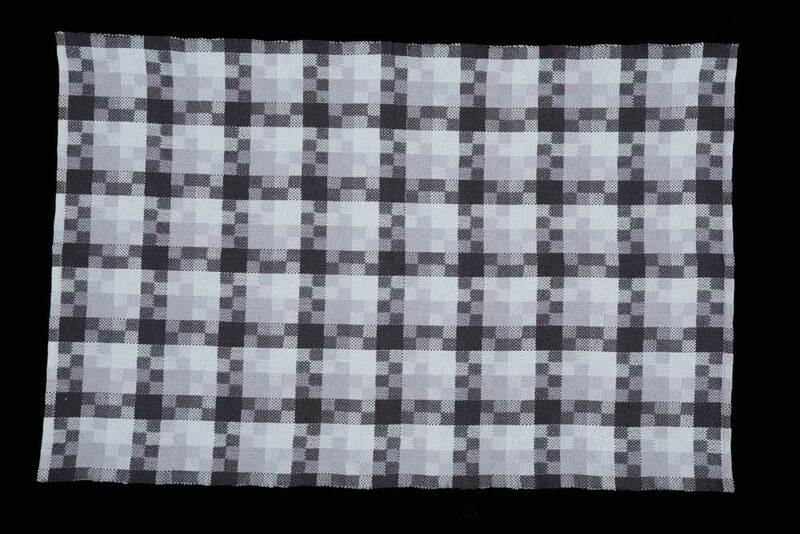 This pattern will use the five shades of gray, plus white, for the pattern. 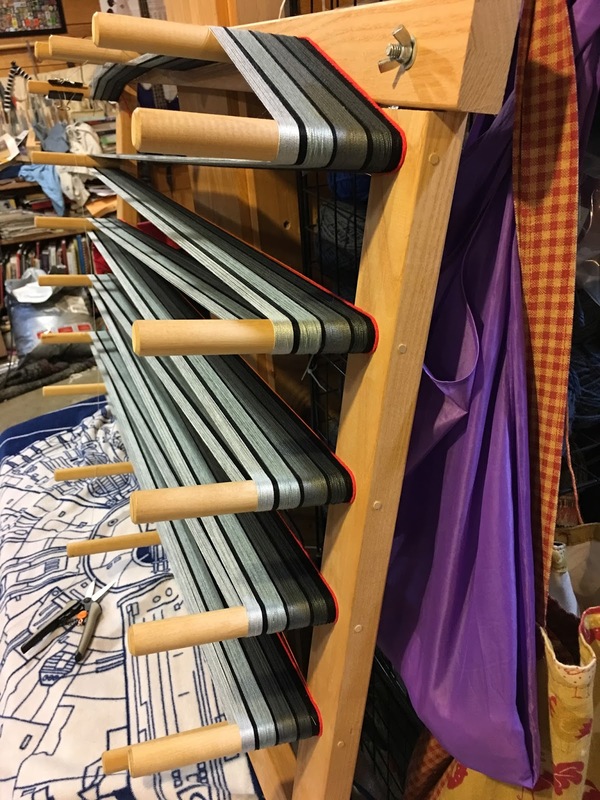 It will go from dark gray to white, then back to dark gray - 11 sets, with black outside edges and thin black stripes between the colors. 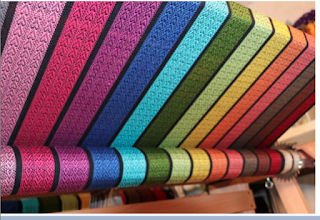 I will be using black for the weft as well. The pattern draft for this is the Jack Hearts draft from the Ashford New Zealand website. This is the progress on the baby blanket after my weaving-in-the-semi-darkness episode. 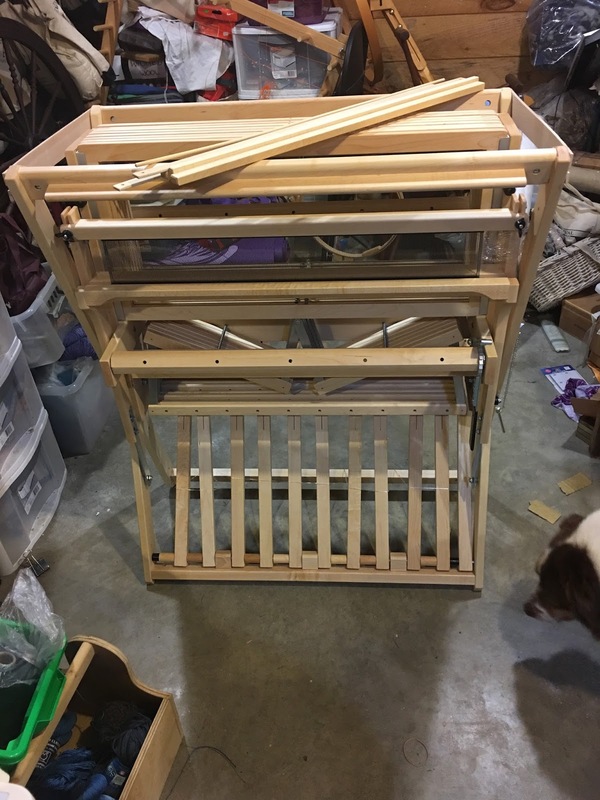 This is about half done, if not more, and I will be putting the gray Hearts towels on this loom (the big Macomber) next. 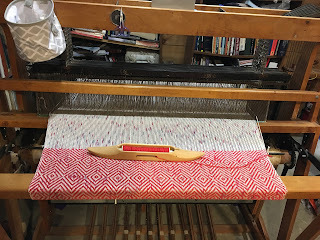 Following this (and the finish of the Artist towels on the Baby Wolf) I am planning to start a set of Pinwheel towels in white and Peacock blue cotton. 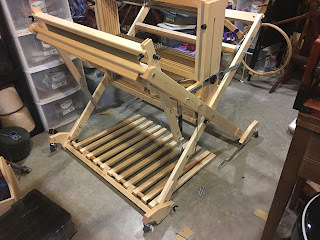 I may go ahead and warp this while weaving these other projects. 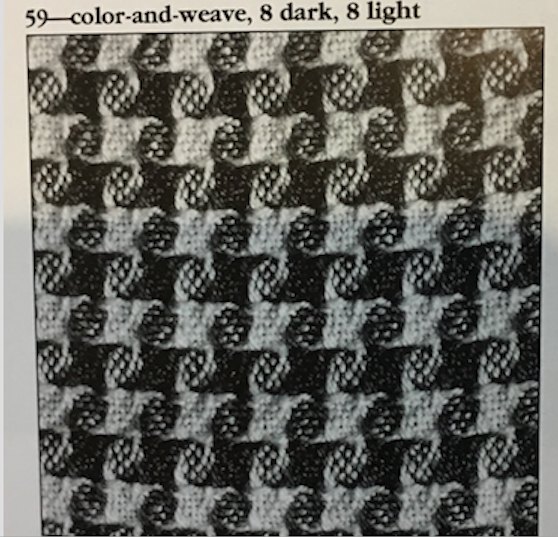 The draft is from A Weaver's Book of 8 Shaft Patterns by Carol Strickler, #59. 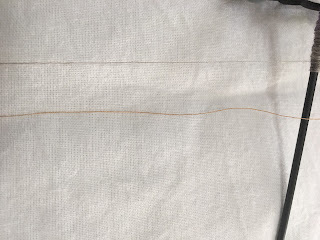 I saw a Ravelry project using this draft, and the same Peacock blue cotton that I already have, and it was spectacular. My new loom is here! 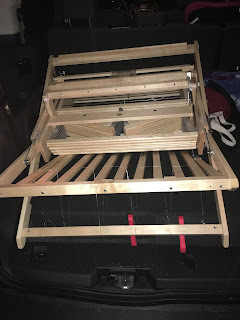 Way back in January (January 4, to be exact) I ordered a new 8-harness Schacht Baby Wolf loom, complete with all the bells and whistles - height extenders, stroller wheels, and high castle tray. 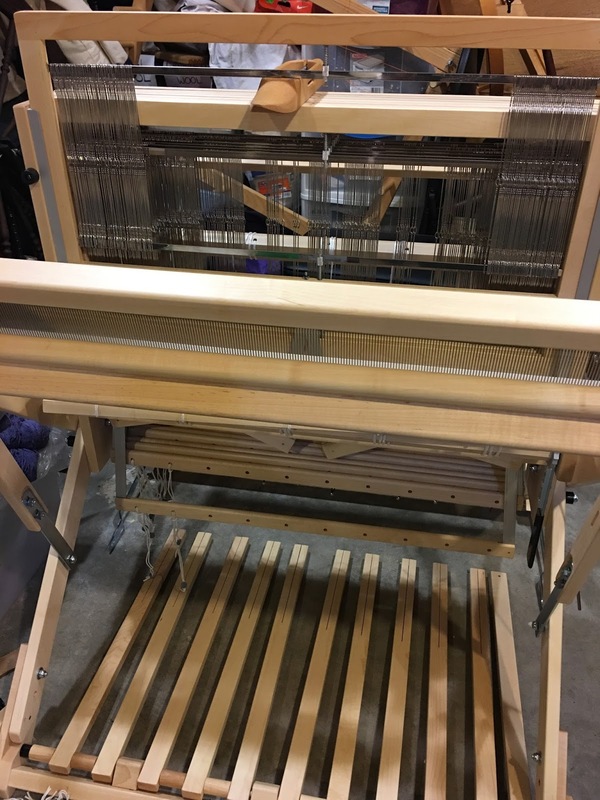 It has been a long, difficult wait (especially since I am generally lacking in patience), but on Friday, my loom finally arrived! 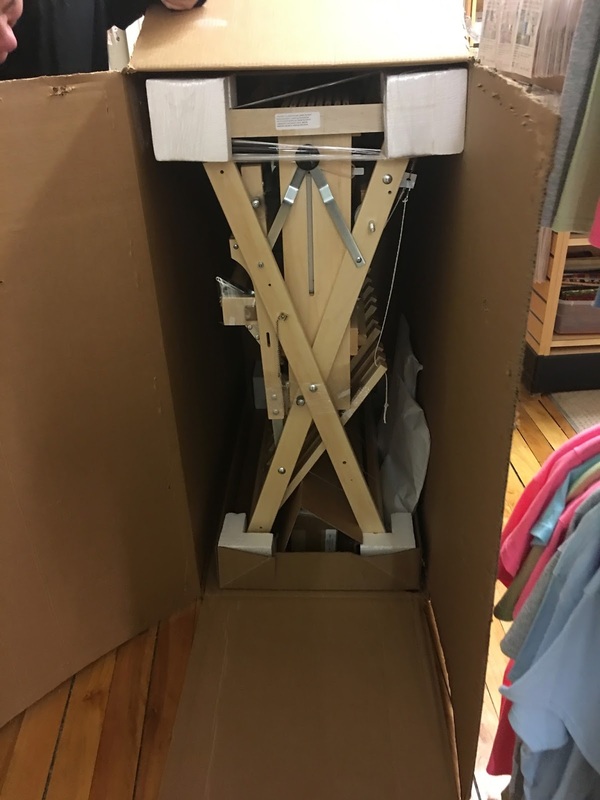 It was shipped to the local yarn shop where I had ordered it, The Yarn and Fiber Company in Derry, NH. 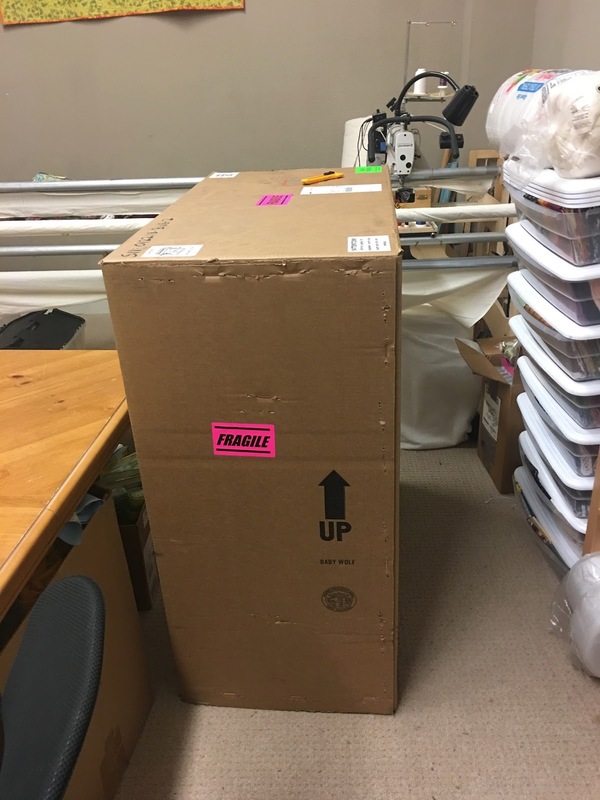 I loaded it into my van and brought it home. 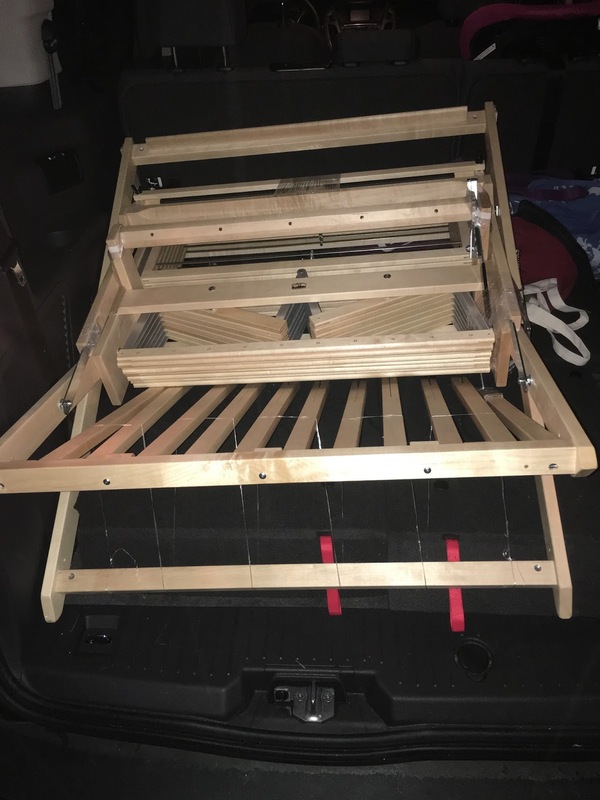 Of course, it was raining, and I didn't want to be hauling it out of the van and across the lawn (and down into the basement) in the dark, in the rain, so it stayed in the van overnight. Yesterday I brought it into the house (with help) and started the assembly (without help). 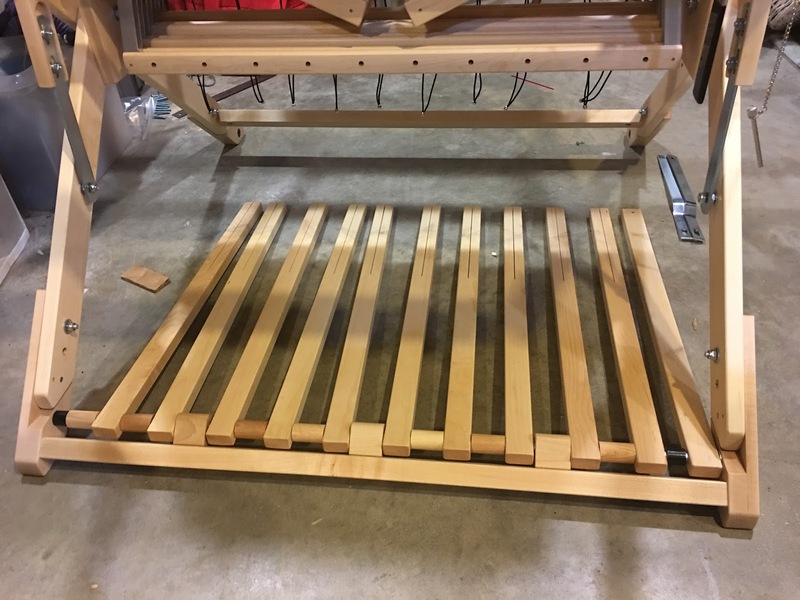 First I added the height extenders. 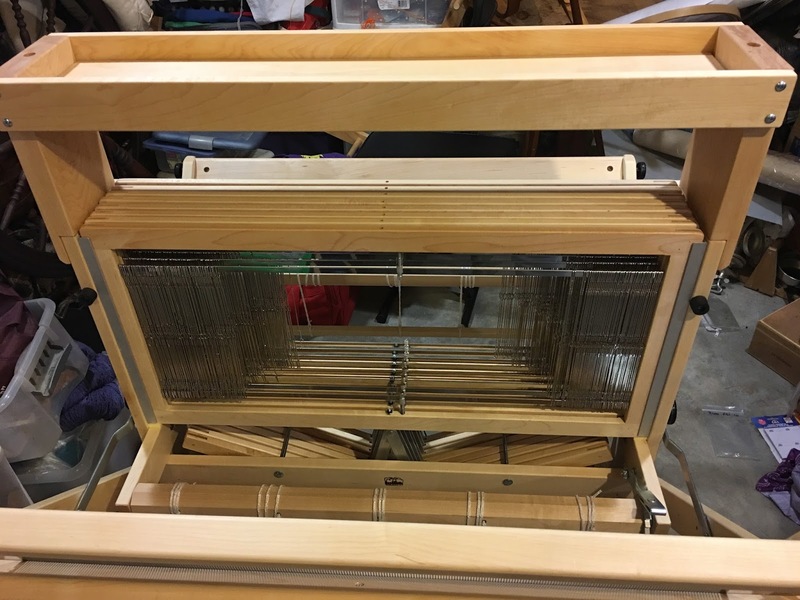 They make it easier for taller people to weave on this compact, portable loom. Then, for further portability, I added the stroller wheels. 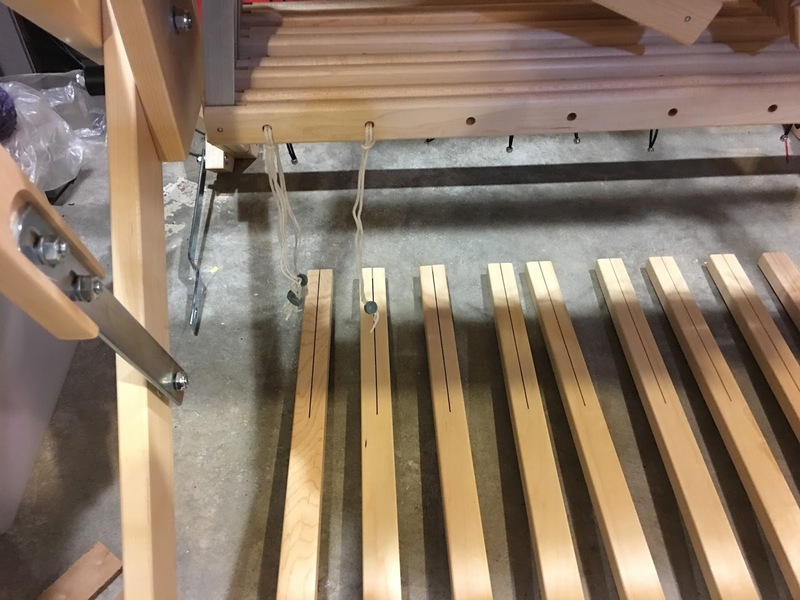 The wheels engage when the loom is folded up and make it easier to move the loom around. That was as far as I got with the time I had yesterday. I started again this morning, after morning chores and grocery shopping. 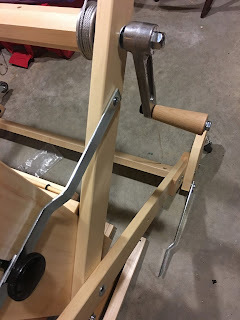 I connected the crank handle to the back beam. 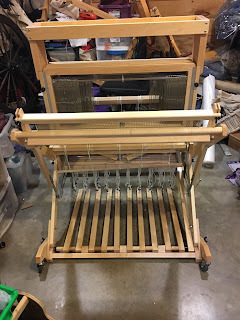 Then I added the texsolv cords to the front (cloth) and back (warp) beams, and added the apron rods for both beams. 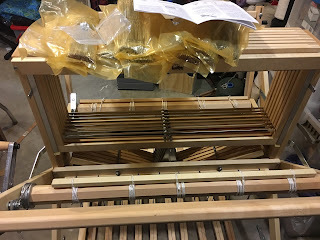 Then it was on to the heddles! 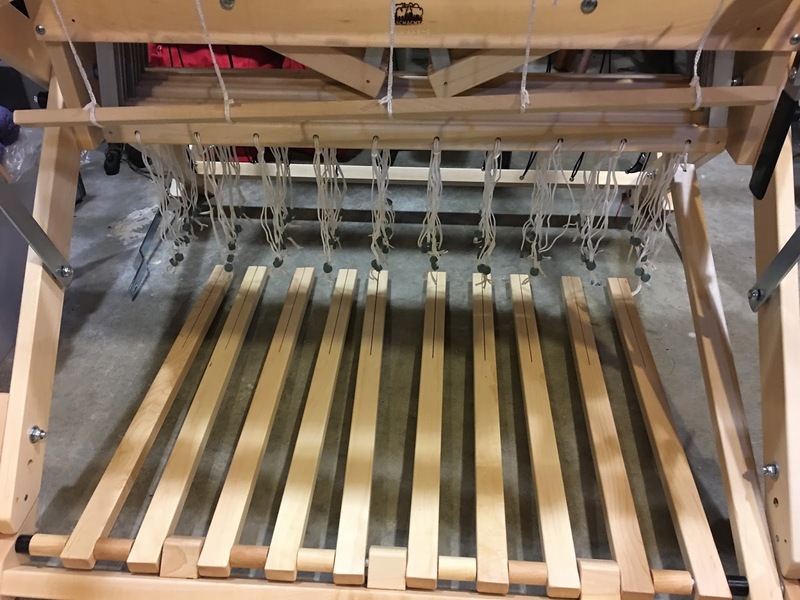 The loom comes with 800 heddles - 100 for each of the 8 harnesses. 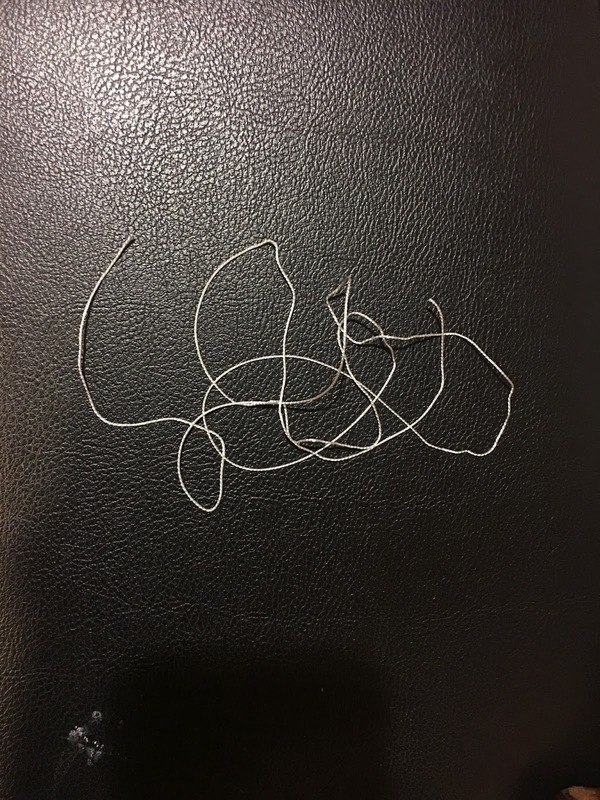 There were 8 bags, each with 100 heddles that were tied together with a nylon string. They were fairly easy to string onto the heddle bars. 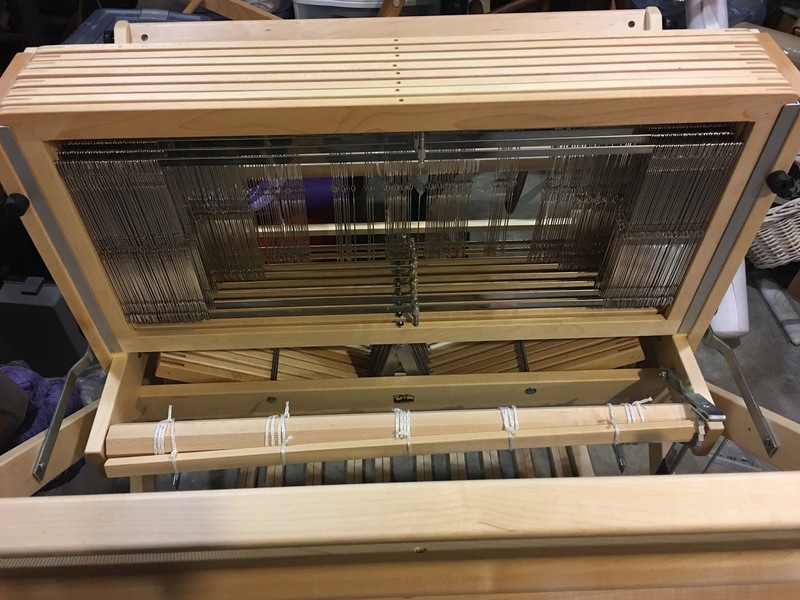 I had to remove each harness frame individually, move the heddle bars, string the heddles on, then put everything back together and put the frame back into the loom. Repeat x8. I kept all of the little nylon strings that tied the individual harness bundles together. They strike me as perfect for scotch tension cord for spinning wheels! Why waste a perfect brake cord? All harnesses and heddles finished! 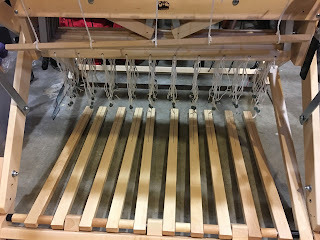 Then I had to attach all of the treadle tie-up cords to the lamms (the horizontal wooden bars with holes). 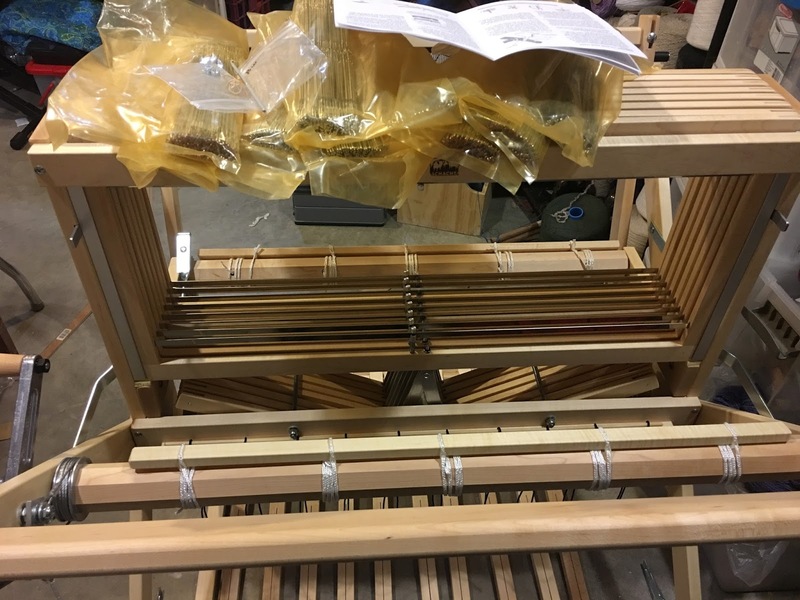 There were 80 to attach - 10 on each lamm (because there are 10 treadles to potentially tie up), and 8 lamms (one for each harness). I found out I could prop up a harness, one at a time. I used a shuttle for that. 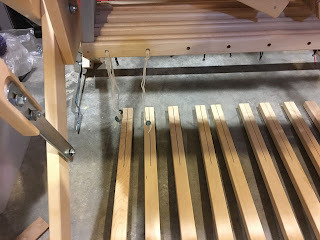 Propping the harness lowered the corresponding lamm below, and made it easier to thread the texsolv tie-ups through the holes in the lamm. All done! 80 texsolv tie-up cords in place! 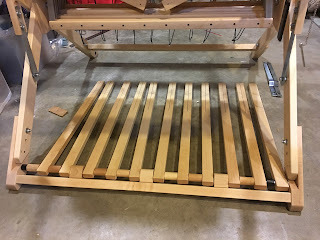 The last thing was to assemble the high castle tray. 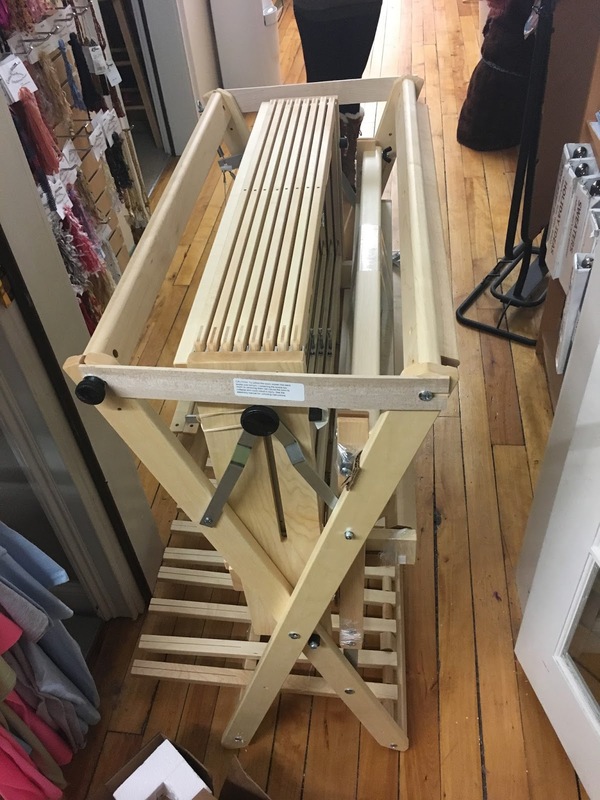 This lets me keep everything for a project (bobbins, shuttles, threading hook, etc) easy to reach. Done! Now I am contemplating what to put on it for my first warp! 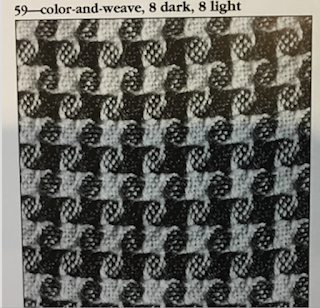 I have several Cotton Clouds kits, plus quite a few awesome weaving drafts (like heart patterns, and a couple of geometric ones with squares, etc) that I'd like to make. I also signed up for a kitchen towel exchange and I have to get those done by mid-April. It will be fun deciding what to begin next! 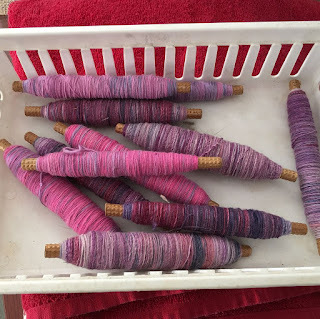 I've been spinning a lot lately! 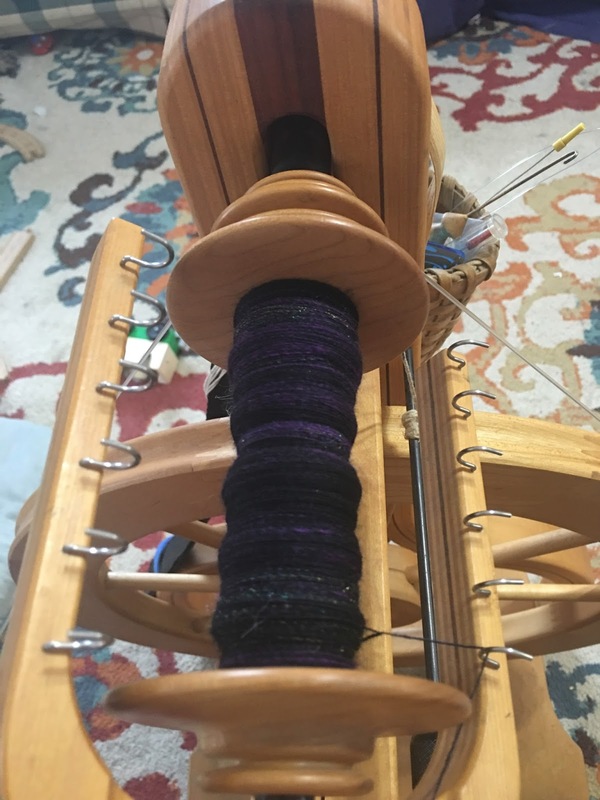 I think it's the first time I've done any considerable amount of spinning since the grandson came to live with us 3-1/2 years ago. 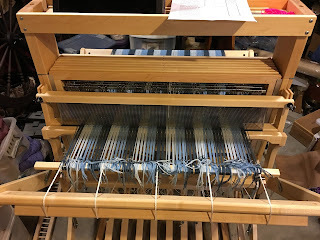 I have also been playing with some CVM from Long Ridge Farm, and a Trillium drop spindle from Bull Sheep Fibery on Etsy. 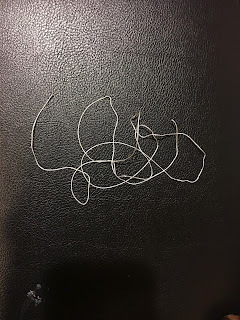 I'm going to consider this practice for a potential Longest Thread entry. 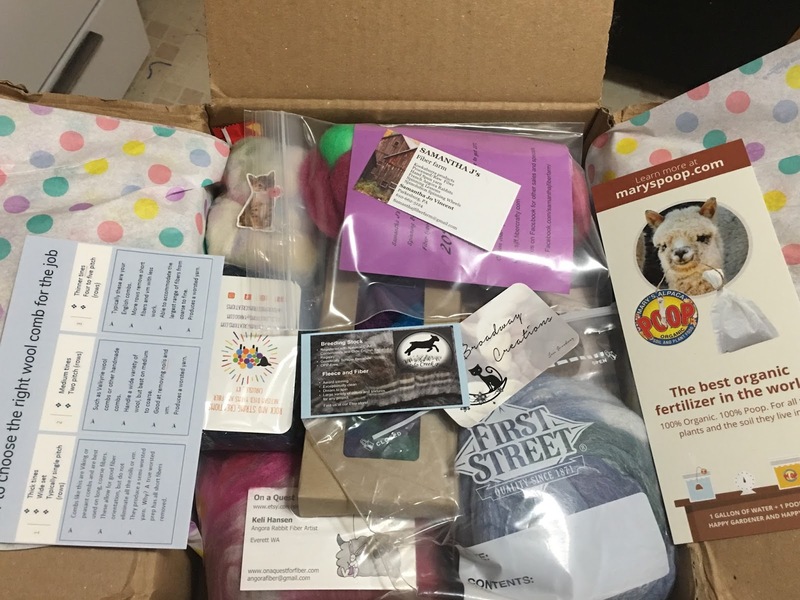 The Longest Thread contest is about a year away (maybe 13 months) but mailing deadline for entries is about the end of October. Every year that they have it (odd years) I say I’m going to do it, but never have. And it takes a LONG time to spin up the required 10 grams (about 1/3 of an ounce) of wool (and now they allow alpaca as well) THAT thin. Here’s the beginning of my first practice. Gold thread is sewing thread, for comparison. I love this spindle! It's about 7 grams in weight. I also got a great Spinning Box this week. 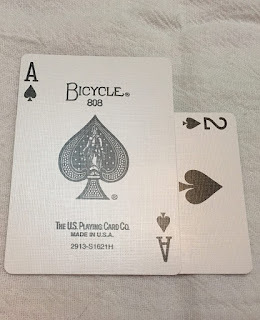 This has undoubtedly contributed to my continued enthusiasm with my spinning! New babies! 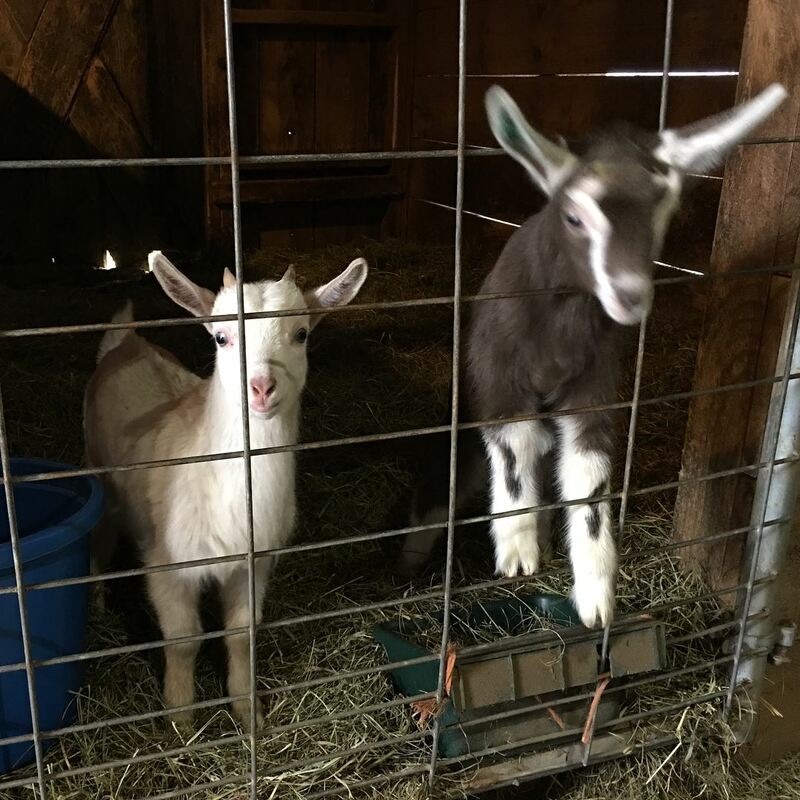 Hubby told me for Valentine's Day that I could get some baby goats, and I've been waiting to pick up these babies since then. I wanted specifically a boy and a girl, and I wanted large breed dairy goats. 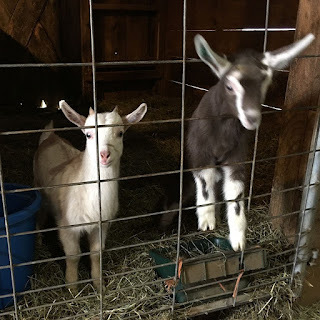 (I do not want to breed Nigerian Dwarf goats, cute as they are, nor do I want to cross-breed mini goats from a ND buck crossed on a full size doe). 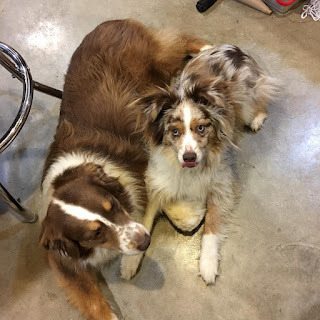 I needed to get a boy, to breed my girls this fall, and wanted him to have a companion his own age. As I definitely do not need two bucks, the companion needed to be a girl. Vinnie was born Jan 17 and is a Saanen/Alpine cross buck. 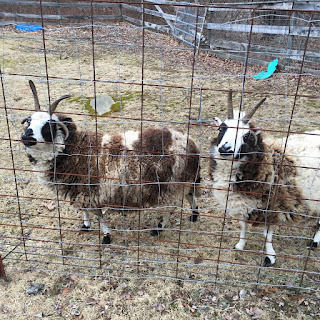 Katie was born Jan 23, and is 1/2 Toggenburg, and 1/2 Nubian/Alpine. 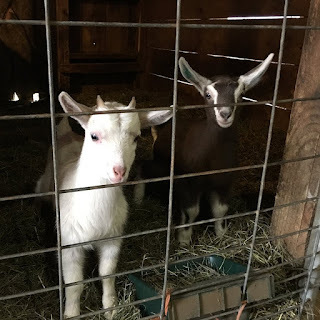 I also took some updated pics of the other hoofed barn denizens. This is Jenny. 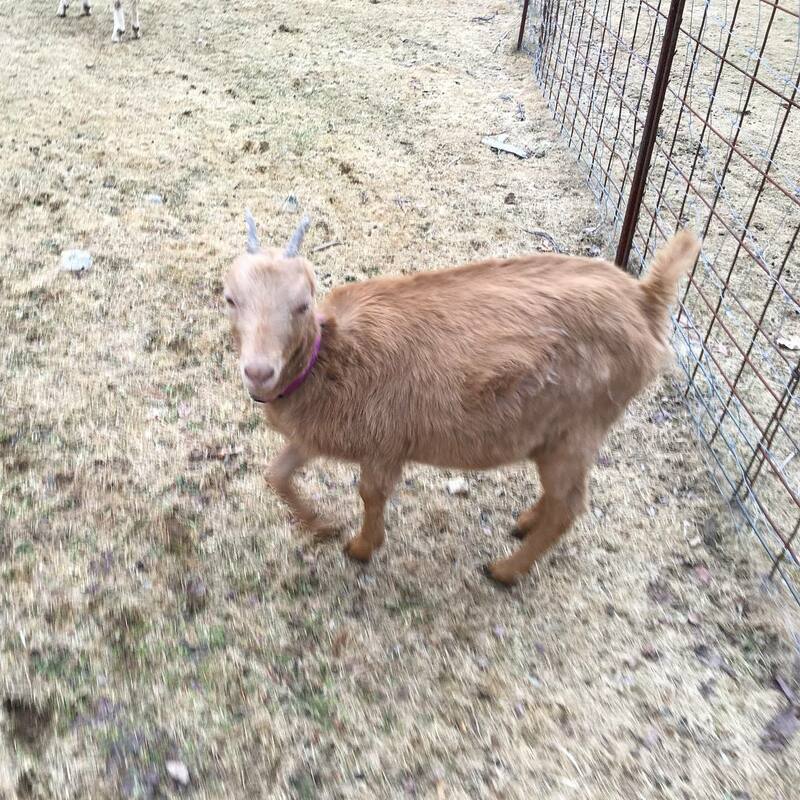 She is an 11 month old LaMancha doeling. Note, no ears! (She actually has tiny, tiny ear flaps.) 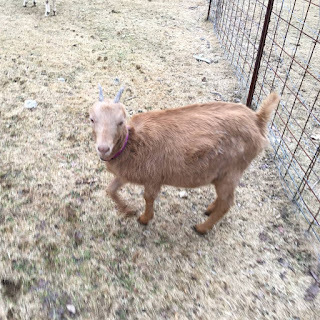 It is difficult to get a picture of Jenny because she is either running or else standing right next to me (makes for some awkward photos). Jenny with Margot, 2 yr old Alpine doe. 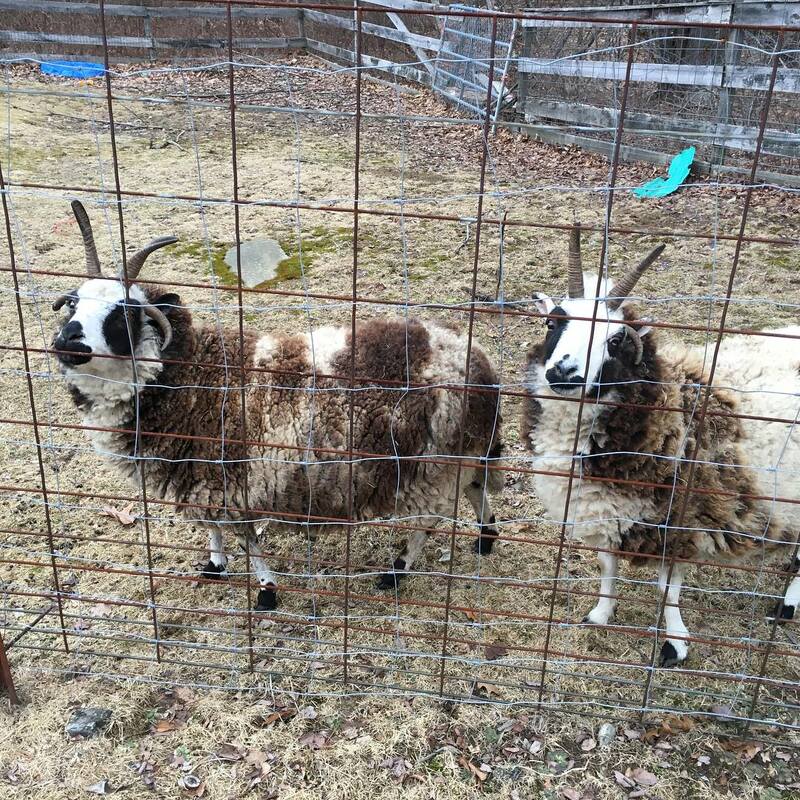 And the last two are my Jacob sheep, Talullah and Daisy. They are about 7 or 8 years old. I took a brief video of the critters being silly while I was out in the pasture. Besides seeing silly critters, you can hear a rooster crowing, dogs barking, and the baby goats hollering. 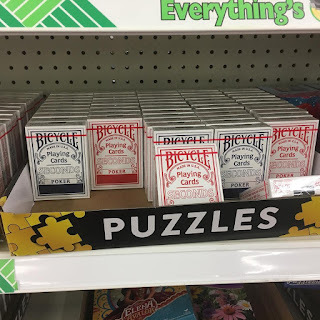 Yesterday I was at a dollar store and came across some cheap playing cards! 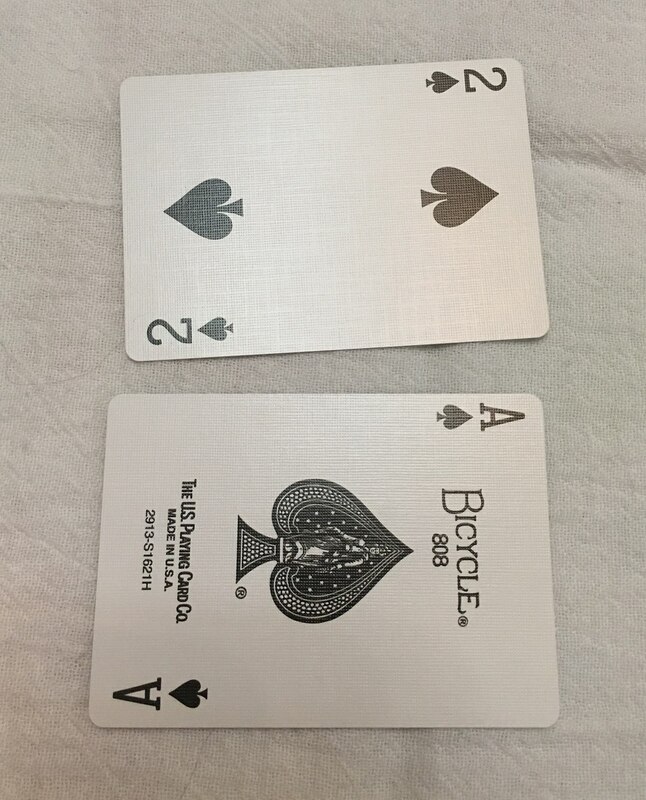 These were labeled "Seconds", but hey, they were $1.00 a deck! 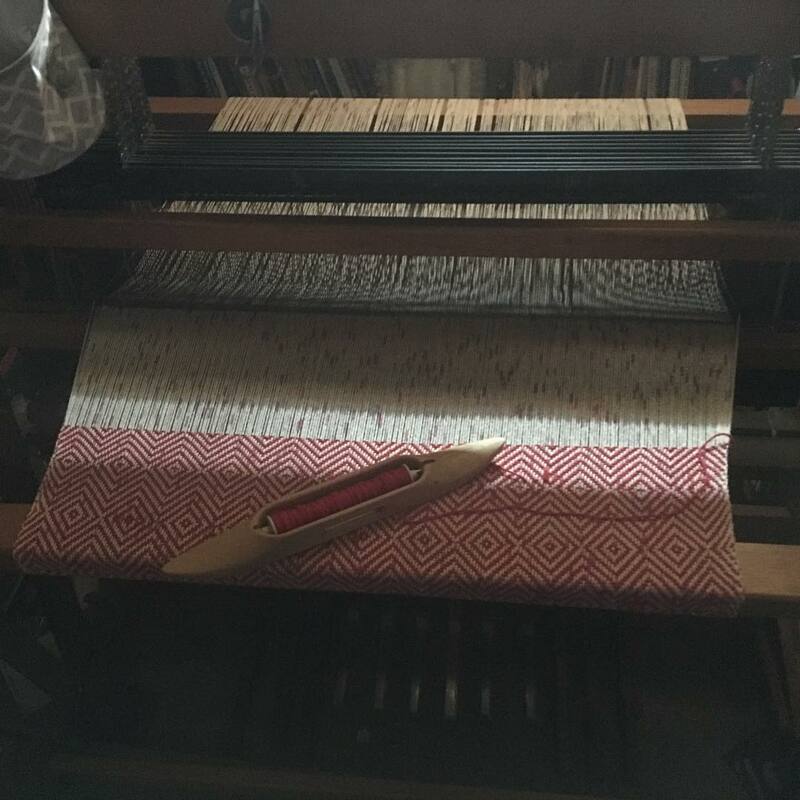 I grabbed two decks - one red, one blue - to make into tablet weaving cards. 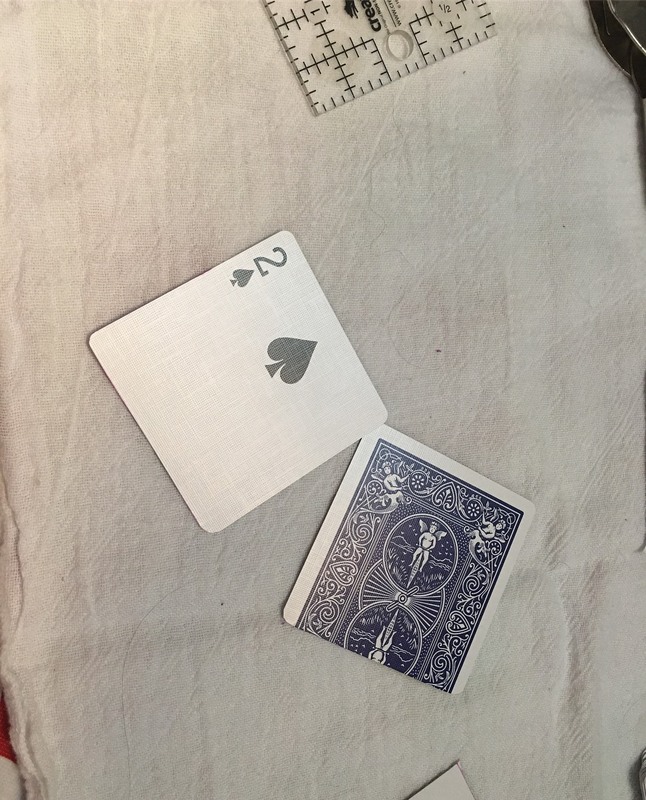 I posted about it on Instagram, and someone asked how to make tablet weaving cards from playing cards, so I made a quick photo set to illustrate. 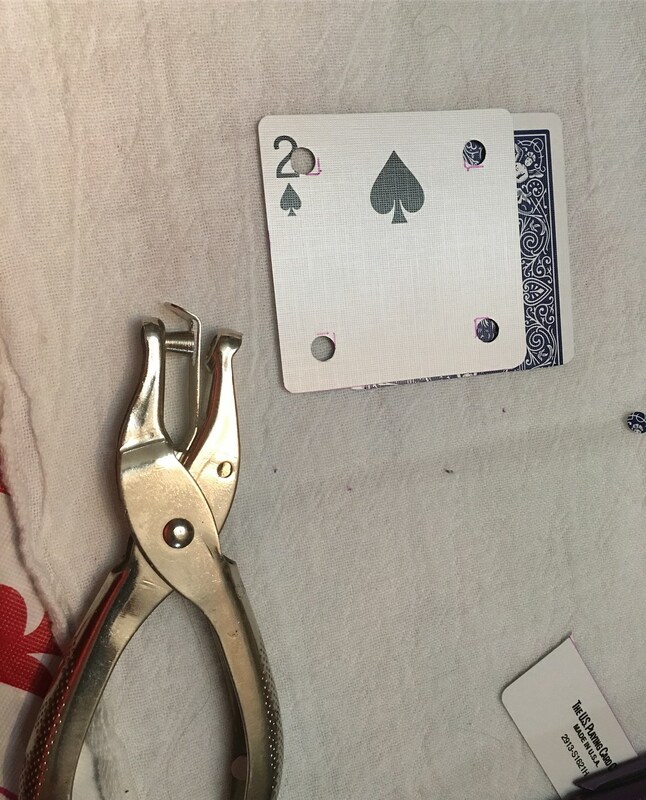 First you have to square up the cards. 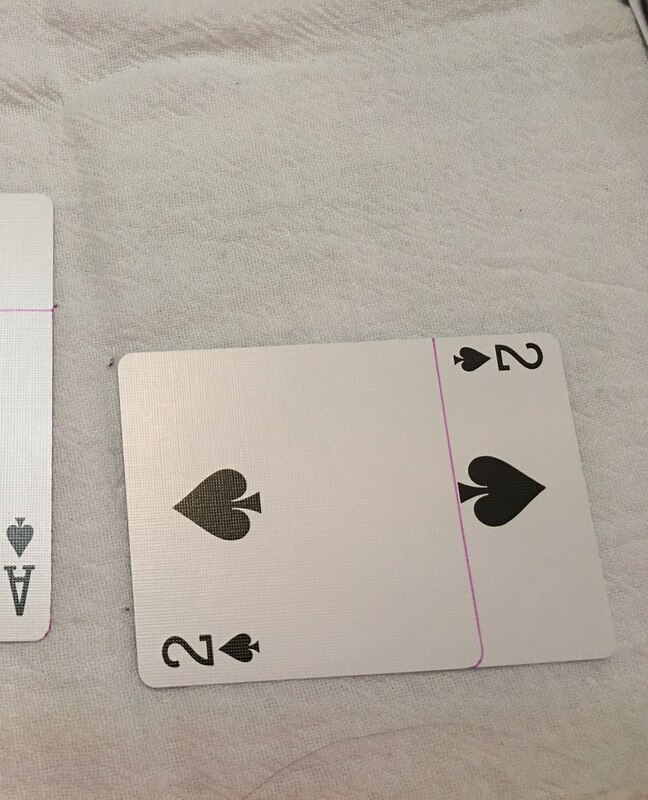 I overlap them at right angles, making sure two sides line up, and draw a line. 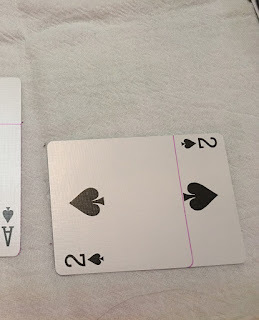 Cut on the line, and round the corners. 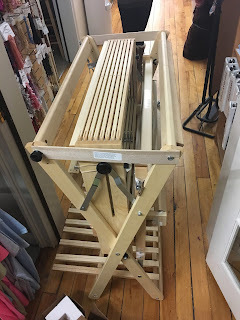 Some people purchase a corner rounding punch - apparently there are such things, among scrapbooking supplies at craft stores. 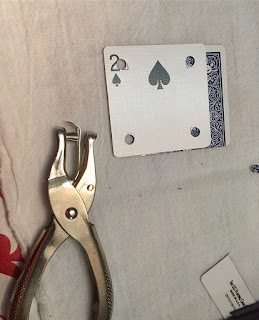 I saw some and could not figure out which corner rounder I wanted - they do cut slightly different shapes - so I just judge it by eye and do it by hand with my scissors. 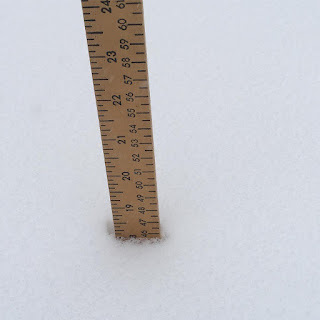 I then use a ruler and mark a set of lines half an inch in from each corner. This is where I will punch the holes. 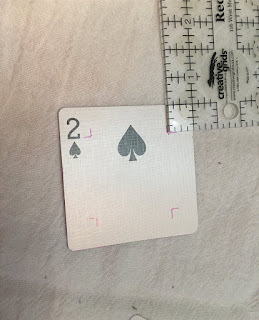 I punch the holes where the corners are marked. After that I mark the A-B-C-D on each corner with a Sharpie marker. 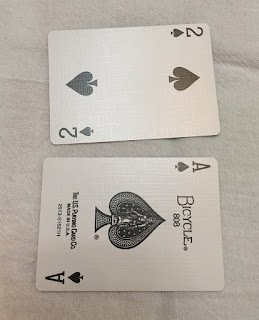 Some people don't mark the A-B-C-D, but I find it makes it easier for me to follow where I need to stop and start in a pattern, as well as letting me know where I stopped. 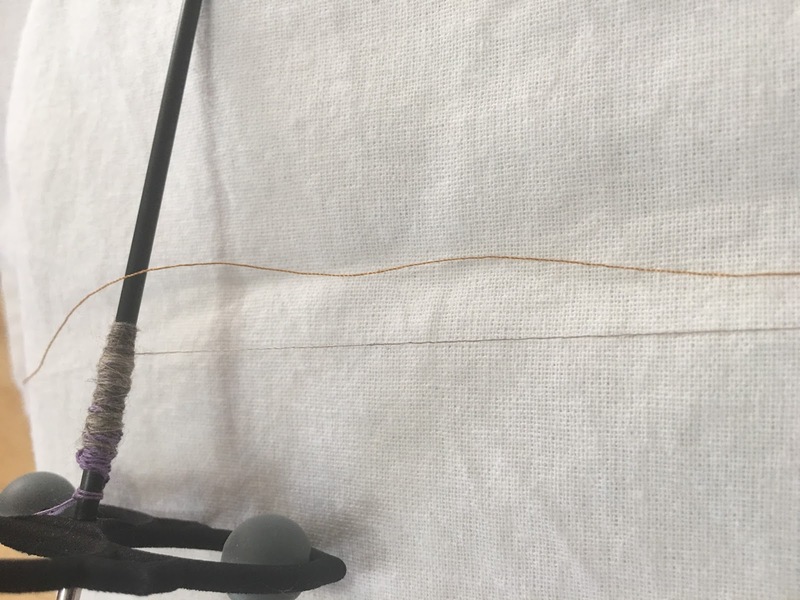 When I'm doing tablet weaving, I try to stop after one full repeat - so if I start with the A at the top away from me, I want to do my 4 forward, 4 back, and end with the A in the same place. 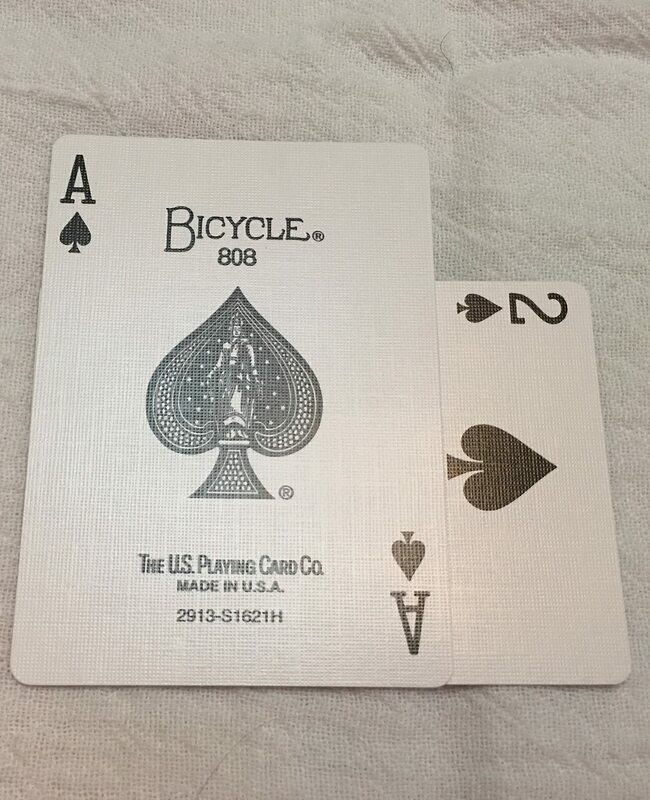 I suppose the card number could serve the same purpose, but it doesn't take me long to write on the cards. Someone else said she colors the edges to help her keep track in a similar manner. Mom, grandma, small farmer; love knitting, spinning, quilting, weaving, lacemaking, bicycling, hiking, tech gadgets, learning to play guitar (acoustic, electric & bass) and violin.